Mr. Smith was recently appointed as superintendent of his school district. In an effort to orient himself to the district, he made it a point to have informal conversations with faculty and with members of the community. Through these conversations, Mr. Smith found that Mrs. Greene, one of the district's eight elementary school principals, was consistently described as an outstanding leader. Curious, he decided to pay her a visit. As fate would have it, Mr. Smith arrived at Mrs. Greene's school just as she was about to start her faculty meeting. He decided to wait for her to finish so that they could have their conversation afterwards. When he took a seat, he was immediately surprised at the room arrangement: instead of the traditional rows of chairs facing front, there were tables with four chairs at each. He thought to himself that this was an invitation to trouble—teachers would be just like the kids and talk to each other the whole time Mrs. Greene was talking. He also noticed there were refreshments on a table near the side of the room. He wondered if they were celebrating something special. In the front of the room was a poster titled “Faculty Meeting Ground Rules.” These rules seemed like an interesting idea. He wanted to see if the staff members would follow them throughout the course of the meeting. A few minutes after students were dismissed, staff members began to arrive at the meeting. Mr. Smith was struck by how many teachers arrived before the meeting started with smiles on their faces. After allowing a few minutes for staff to get refreshments and engage in informal conversation, Mrs. Greene started the meeting by quickly reviewing the agenda. Next, she asked staff members to engage in what she called a “staff building” activity; then to engage in “team building” activities at each table; and finally to engage in a combination of small- and large-group activities related to the use of technology in achieving math and reading goals. Mr. Smith was struck by the nature of the conversations at the meeting: everyone appeared to be actively listening and passionately sharing ideas while remaining focused on the topic under discussion. Mr. Smith had never seen anything like this; it struck him that the meeting resembled some of the better classroom lessons he'd observed as a principal. When the meeting was over, Mr. Smith met with Mrs. Greene. After revealing how dreadful many of the meetings he'd both led and attended had been, he wanted to know how she had managed to create such a productive and stimulating experience. Her answer was so simple that it surprised him. She said that she ran her faculty meetings like she had run her classrooms: she laid the foundation for success in the beginning of the year, then planned each meeting as carefully as she did her lessons as a teacher. Communicate the purpose of faculty meetings. Collaborate with staff on developing norms for expected behavior. To build relationships among staff. Many teachers feel isolated from their colleagues, which can in turn make them feel alienated from their work. Building relationships with colleagues is necessary for them to feel engaged. To focus on professional development. Because faculty meetings are among the few occasions when the entire staff is together, they provide a precious opportunity for systematically building the instructional capacity of teachers. To solve problems and make decisions. Sometimes, critical decisions require input from the entire school community. When structured appropriately, faculty meetings can provide a forum for this input. All information that can be shared in writing prior to the meeting will be included in the weekly staff bulletin. Staff members are responsible for reading this bulletin and seeking clarification when necessary. Instead of information transmission, our faculty meetings will now emphasize relationship building, professional development, and problem solving and decision making. If we do not have an activity that meets the criteria in #2 above, we will not have a faculty meeting. I realize this new format may make some of you uncomfortable. To let go of the way we always do things and try something new requires us to take a risk. The long-term benefits of this change will be worth it for us as a staff and our students. If you have any questions, please stop by and see me. Clearly articulated and agreed-upon norms contribute to an atmosphere of trust, which is itself essential for successful collaboration. At the first faculty meeting of the year, you should facilitate the collaborative development of such norms, which will be based on the values, expectations, and past experiences of staff members. The following activity can help you to accomplish this task. Step 1. 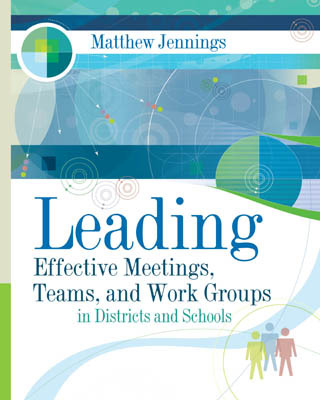 Begin by facilitating a discussion of group norms. Example: “We have all been part of a team. In any team there are certain rules or expectations for how we will behave. What were some of the rules or expectations on teams on which you've served? What are some of the behaviors, both positive and negative, that you have experienced on a team?” Record the responses on a T-chart. Step 2. Discuss the messages that the behaviors listed on the T-chart send to other team members. We will start and end meetings on time. We will actively listen to each other's ideas and opinions. We will make important decisions through consensus. We will work from a staff-developed agenda that is distributed 24 hours prior to the staff meeting. We will remain focused on the topic or task. Step 4. Have staff members divide a piece of paper into two columns. Inform staff members that they each have 100 points, which they must divide among all the agreements listed. (The more points, the more valuable the agreement.) Once staff members have all completed the task individually, ask them to share their scores in groups of three or four and complete the activity once more. When everyone is finished, collect and tally the second set of scores. The top three to five choices will then constitute the group's agreements for faculty meetings. It is often necessary to remind staff members of the established agreements, either verbally at the beginning of a staff meeting or in the form of a poster prominently displayed in the meeting room. Base teams should have between two and five staff members, with four being optimal because it allows for pair work. You can assign members at random, or choose to include a mix of grades, subject areas, or experience levels on each team. Either way, teams should be relatively heterogeneous and represent more than one grade level or subject area. (To keep things fresh, be sure to disband the teams and form new ones after every six to ten meetings.) At a minimum, teams will meet at the beginning of each meeting to celebrate a teaching success from the previous week, and at the end of each meeting to summarize the proceedings. The recorder writes down details of the meeting, such as the people present and the agenda items, along with any relevant information discussed. He or she should also produce written minutes of the meeting and distribute them to all staff members within 48 hours. The timekeeper watches the clock and warns fellow members when the designated time for each agenda item is over. Whether these roles are permanent or rotate is up to you. Permanent assignments have the advantage of consistency and of helping staff members develop role-specific skills over time. Rotating assignments have the advantage of promoting equal responsibility among all staff members for all roles. A meeting agenda provides staff members with a guide to the proceedings and encourages them to focus on upcoming tasks. Without an agenda, staff members may have trouble discerning the meeting's purpose. When teachers help shape the agenda, they gain an increased sense of ownership for the meeting. Be sure to set a deadline by which teachers must provide topics in advance. When submitting items, teachers should include their names, the topics they wish to address, and the resources and approximate amount of time that they will require. Figure 1.1 shows a sample meeting agenda. Although not strictly necessary, it is often helpful to share a rough draft of the agenda with staff representatives prior to distributing it, for proofreading and feedback. Whenever possible, staff members should receive the agenda at least 24 hours before the meeting. Advance Preparation: Please read the small-group discussion questions below and reflect on your answers. Recorder: Jane S. Timekeeper: Ralph R.
What cooperative learning strategies have worked successfully for you? What problems are you having with implementing cooperative learning strategies in our classrooms? What cooperative learning strategies would you like to learn more about? Participants will contribute more to and get more out of meetings if the physical setting is comfortable and conducive to achieving the meeting's objectives. Here are a few guidelines to consider in this respect. A U-shape or semicircle arrangement is best for groups of 12 to 22 staff members, and is well suited to large-group discussion. A single square or round is best for groups of 8 to 12 staff members, and is well suited to problem solving. A V-shape arrangement with tables of four to five participants apiece facing the front of the room is best for groups of 16 to 40. This arrangement is well suited to small-group work at each table. A traditional arrangement of front-facing rows is appropriate for any size group, and is particularly well suited to the imparting of information by the facilitator. Room temperature. Though often overlooked, setting an appropriate room temperature is essential for a comfortable meeting environment. Most people find the optimal temperature to be between 68 and 72 degrees. If weather conditions permit, you can provide additional air circulation by opening doors and windows. Music. People respond well to appropriate music. Not only does it connect with them emotionally, but it also helps to break their normal thought patterns. Music within the range of 65 to 80 beats per minute is best for setting a positive mood. Use familiar tunes and songs in major keys (e.g., “Don't Worry, Be Happy” by Bobby McFerrin). Smell. Aromas can powerfully influence the mood of a meeting: whereas peppermint, lemon, and cinnamon scents enhance alertness, for instance, lavender, orange, and rose scents encourage relaxation. If real estate agents are convinced that the smell of freshly baked bread can sway potential home buyers, then perhaps the smell of freshly baked cookies can positively influence meeting attendees. Red evokes anger, intensity, and danger. Use this color to highlight warnings. Yellow evokes happiness, cheerfulness, and warmth. Use this color when generating ideas and supporting creativity. Blue evokes reliability, trust, and tranquility. Use this color early and regularly in meetings to establish and reinforce trust. Green evokes productivity, growth, and forward momentum. Use this color when striving for compromise or consensus. Orange evokes energy, enthusiasm, and positive thinking. Use this color to highlight a subject or demonstrate connections between ideas. White evokes honesty and innocence. Use this color when striving for clarity and order. Black evokes independence, seriousness, and finality. Do not use black when brainstorming. Refreshments. Refreshments can provide attendees with a physical and psychological boost. This is particularly important because most faculty meetings occur after school, when energy levels are low. Food and drink can also facilitate community building by encouraging socialization among participants. For meetings lasting 30 minutes or less, snacks that are high in sugar (fruit, candy) are acceptable; however, because too much sugar can lead to drowsiness after a while, meetings lasting longer than 30 minutes should include foods that are high in protein (lean meat, yogurt) or complex carbohydrates (nuts, whole grain bread).